Read on for a tip on efficient solar water heating, from HTP's National Solar Manager Rod Hyatt. 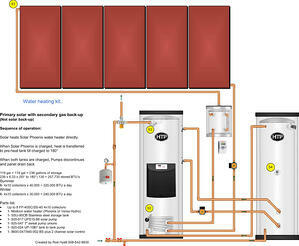 For the most efficient solar thermal design, solar-heat the water heater first. I know that may seem self-evident because it’s the water heater that you’ll draw from when you run a bath. But I continue to see system designs where the solar storage is heated first. So, basically, the water heater is using fuel to warm the water for your bath, while the sun’s hot water is being stored. Does that make any sense? Why not heat the water you’re actually using? Always heat the water heater first — and then send the over-flow heat into a storage tank. It is paramount that solar is delivered as close as possible to the point of use. Don’t send solar heat to a distant storage tank that feeds the water heater. Feed the water heater first. And don’t pre-heat the water heater. Let solar do as much as it can. Here’s how to achieve this simpler, more efficient design. This first drawing is for a design that will heat solar water in residences, as well as the commercial arena — laundry, restaurant, hotels, car washes and apartments. It would also work with residences that have side heating loads — such as fan-coils, a pool or hot tub. It features the Mon Con water heater. The Mod Con stands for modulating and condensing — condensing gives you the 96% efficiency; modulation gives you lower firing rates to react more efficiently to the solar input. 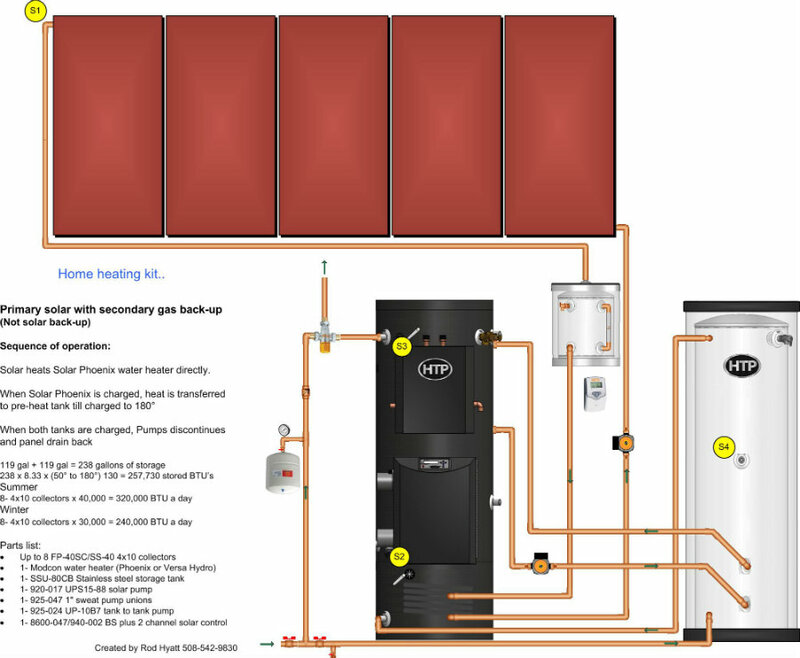 The second diagram shows a design for a low-temp space heating, with the Versa Hydro water heater being heated by the sun first.